Reporter Shane Ryan spends one year on the PGA tour and reports on the new breed of up-and-coming golfers. 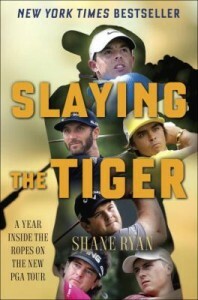 Slaying the Tiger is eye opening to anyone interested in the game of golf. What you see on TV is now what the players are really like. Many players have public relations staff who control the player’s image. More importantly—what does it take to be a winner? What games do players play and does the rich junior player have the advantage? A must read for anyone who likes the game of golf and wants to know who the next Tiger will be. Daniel James Brown captures the essence not only of this story but also of the sport of crew—the physical strength of the rowers, the strategy of the coxswain, the design of the boat. The author’s eye for detail is reminiscent of the writing of Laura Hillenbrand. The Boys in the Boat focuses on the life of Joe Rantz, who, like his teammates, grows up during the Depression and struggles just to survive. These eight young, powerful rowers guided by a brilliant coxswain rose from humble beginning to win the gold at the 1936 Olympics. You will be cheering them on all the way to the finish. In Dream Team: how Michael, Magic, Larry, Charles, and the greatest team of all time conquered the world and changed the game of basketball forever, sportswriter Jack McCallum presents a behind-the-scenes look at the creation and execution of the greatest basketball team ever assembled. I was eight during the 1992 Summer Olympics in Barcelona, so my memory of the events is a bit sketchy. I loved learning about the politics behind the creation of the team (ever wonder why Isaiah Thomas wasn’t invited? ), the antics of the players in Monte Carlo and Barcelona, and their post-retirement lives. I grew up idolizing Michael Jordan and Scottie Pippen– this is a great glimpse into one part of their storied careers. The author interviewed each member of the team in 2011, plus he was part of the contingent of journalists following the team in 1992 (and a basketball writer for Sports Illustrated in the years before and after). There’s at least one chapter on each member of the team: 11 of the 12 members of the 1992 Dream Team are members of the Hall of Fame (mindboggling, isn’t it?). Want to learn more about the Dream Team? Check out a NBA.com article complete with images and video clips. Bill Veeck was at different times the owner of the Cleveland Indians, the St. Louis Browns, and the Chicago White Sox (twice). Many people remember Bill Veeck as the baseball owner who brought Eddie Gaedel, a 3’7” tall man in as a pinch hitter in a baseball game between the St. Louis Browns and the Detroit Tigers in 1951, or as the White Sox owner responsible for Disco Demolition Night. Still others may remember him for the funny and outrageous but harmless promotions he conducted as owner of the Indians, Browns, and White Sox. But he was much more than that. He was a great humanitarian, an advocate of civil rights, a baseball fan’s owner who cared about the fans, a player’s owner who cared about his players, an employer who cared about his employees, an innovator who introduced many changes in the game, a patriot, a thinker, a listener, an avaricious reader and man who despite a severe physical handicap would never quit. This is easily the best biography I have read in the last twenty years and maybe the best ever. This book is especially for White Sox, Indians, and Browns fans. It’s for Cub fans too, as Veeck and his father had a profound influence on the Cubs as well (the ivy on the walls, Harry Caray and the singing of “Take out to the Ball Game” during the seventh inning stretch and others.) But it is also for any baseball fan and for anyone who appreciates the story of man who lived a truly remarkable life. Read Bill Veeck: Baseball’s Greatest Maverick by Paul Dickson. Strength Down the Middle by Larry Kalas is the exciting story of the 1959 White Sox, the great players from the team, a game by game description of the season, some of the exciting events from that year outside of baseball, and a modest six month autobiography of a then eight-year-old boy living on the far southwest side of Chicago. This book is, of course, primarily for White Sox fans but baseball fans in general should also enjoy it. People interested in Chicago history will find it enjoyable as well. Improve your sports knowledge with The Battle that Forged Modern Baseball by Daniel Levitt. Let me just say up front that I loved Laura Hillenbrand’s Seabiscuit. It is probably my favorite nonfiction book. Well, I think, she’s done it again with Unbroken, the biography of an extraordinary U.S. Army Air Force officer, Louie Zamperini, who was shot down over the Pacific. Laura Hillenbrand has presented a remarkable story of human endurance. Zamperini’s story, like Seabiscuit’s, is eternal and inspirational. On a mission over the South Pacific, Zamperini was the bombardier on a B-24. When the plane crashes, he finds himself floating on a raft with little provision for survival. After more than a month on the raft, starving, thirsty and chased by sharks, the ordeal ends with the survivors being captured by the Japanese and imprisoned in a hellish Japanese POW camp. Hillenbrand is an historian and biographer who places herself at the service of her subjects; this makes her books a rare combination of writer and story. Though her prose is short and straightforward, her books are written with a rich and vivid narrative voice that keeps you involved through even the worst of Zamperini’s ordeal. This very funny tale is perfect for golfers or spouses of golfers over 40! A popular satirical fiction writer, Hiassen brings his offbeat sense of humor to real life anecdotes about golf and life. Visit the author’s website and improve your golf game! The title is somewhat misleading as I did not find the book to be very wild. Nevertheless I believe most readers would consider this book a good introduction into the lives Satchel Paige, Dizzy Dean, and Bob Feller and to interracial baseball in the 1930s and 1940s. I was already pretty familiar with Satchel Paige and Dizzy Dean, but I knew very little about Bob Feller. After reading this book, I am going to do some more reading about Bob Feller. If you are unfamiliar with one or more of these men you will certainly be tempted to read more about them. You should at least read the last paragraph of page 277 and the first three paragraphs of page 278. I was laughing out loud after I did. And readers should also appreciate Satchel’s rules for staying young found on page 280. I thought there were too many stories about individual games. (It was like reading 50 pages of box scores at times. Interesting at first, but after a while it just seems too repetitive.) But if you read the book a few pages at a time you will get a lot out of it. Read a review of the book, preview an excerpt and visit the author’s website.